Our Edenbridge AQA / HSE approved Emergency First Aid courses meet an employer’s obligation for a minimum level of first aid training for the workplace, they also meet the pre-entry requirement for some of our more advanced courses. Open courses are now being rolled out in Edenbridge - see below. 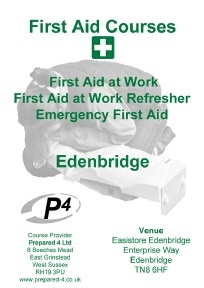 We run open HSE Approved Emergency First Aid Training Courses in Edenbridge, Kent. To see what is included in the Edenbridge HSE approved Emergency First Aid Training Course - click here. The venue is about 2 minutes walk from Edenbridge Rail Station. Map Here. Should you wish to arrive by car, the Edenbridge venue has free parking for delegates. Refreshments are available throughout the Edenbridge course, and lunch can be provided if pre-ordered. TBC June 2012 - Edenbridge. Contact us for date confirmation - click here.